From Red Star Cafe. This made me smile. Free Stuff! And Links! We have links! Marrying years of behavioral and cognitive research with compelling and moving anecdotes, Dr. Bekoff and his co-author Jessica Pierce reveal that animals exhibit a broad repertoire of moral behaviors, including fairness, empathy, trust, and reciprocity. Underlying these behaviors is a complex and nuanced range of emotions, backed by a high degree of intelligence and surprising behavioral flexibility. Catladders blog Yes, these are cat ladders around the world, but imagine how we could mod these for our Shibas. With Tierce (still in his cone, unfortunately) surfing the back of the couch on a regular basis and having a feline-like ability to pick his way along impossibly small pathways, it might be an interesting prospect. Scroll down for great pictures of goat towers. I would love to build a Shiba tower, especially if I got another Shiba. Normal or Obsessive? Normally Obsessive! 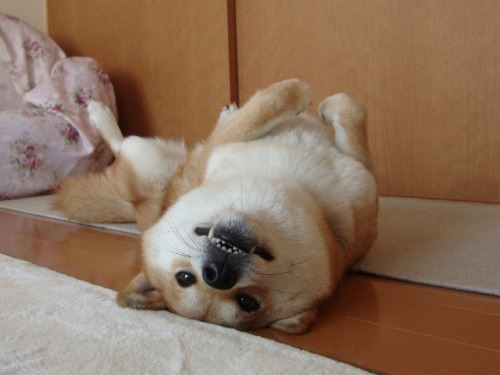 Check out I Am Shiba’s awesome and hilarious post about Shiba stuff. Beware! There are pictures of Shiba-themed items that you will WANT.
. The survey is now complete and you can see the results here. Even if you haven’t seen the survey, the results are interesting. I think the northern/pariah breeds have their own set of norms that are not reflected in the average dog, which can make evaluations like C-BARQ less useful when it comes to determining whether one’s dog is within normal behaviour. Surveys like this help us determine norms in our own breed, something that can aid both novice and experienced owners in their quest to understand the dog they have brought into their lives. They garden! They cook! They do cool things! But most importantly, they are all about Shibas! Check out the Shibaguyz. If you want to put in your 2 cents about your Shiba’s behaviour and temperament, head on over to The Misadventures of a Shiba Inu and take the surveys. If you’re looking for information on how to get two Shibas to get along, check out this blog; there is a lot of information about how Loki and Jujube’s owner deals with having two Shibas, dominance issues and training. Oh well; any online test isn’t guaranteed, right? You can find C-BARQ here. Every so often, I go Googling for “misanthropic shiba” just to see what people are sayin’… and I found this blog post. It’s on NYCGadgetGirl’s blog. NYCGG does her some awesome Shiba Rescue stuff. Anyway she was saying that this very, very old incarnation of TMS was “funnier than hell”. The impression I got was that this site as it is now isn’t quite as funny as that one page I posted eons back. Things change. I changed… a lot from the person who posted that rant/information back in 199-something. Perhaps I’ve lost a little of the irreverence. I still swear on my blog, though! That’s got to count for something. Actually, when I went and reread it, I thought it was still funny… maybe not as Hell, but it could possibly give Hell a run for its money. Maybe I should take the old content and post it on a “TMS in a nutshell” page or “A Heartless Brochure About The Shiba Inu – Print It Out And Tell Your Friends” or something. Thoughts?